In lieu of the recent fashion trend of wearing animal tails as apparel, Raver youth have pounced on a new evolution of the trend. It has been reported that raver youth are actually grafting animal tails to their tailbone with many early adopters having the tails grafted on by peers, leading to several reports of infections within the community. After passing through health codes and guidelines, Doctor Sango now offers the tail grafts to the rave community at a discounted rate. Many parents are outraged that such an operation can be available to youth but others have argued that having the surgeries done professionally by a certified doctor ensures that infections are no longer a problem. "I look at it as an evolution of piercing culture," says Dr. Marc Sango. "I offer the operations in a clean and secure environment and require that my clients be alcohol free when making the decision to graft the tail on." Dr. Sango intends to expand the quickly blooming tail-grafting industry, pending further reviews from the health board. Until then, Dr. Sango's license permits him the right to offer and run a single location his tail-grafting business, which has already been classified as a cosmetic surgery. 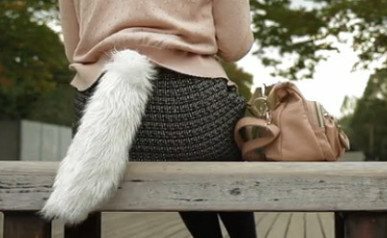 With over 50 different animal styles to choose from, tail-grafting is slowly making its way into mainstream fashion.